"A Big Game Hunter's Paradise"
We had another fantastic Spring Bear hunting season, even better than last year and I didn't think we could beat that one! We hosted 31 hunters who killed 38 bears. 30 of the 38 bears were males and 24 of them were big, 18 plus inch skull boars, most were 18 1/2 inches or better, plus unfortunately we had several wounds on other big bears. Then 18 of those 24 bears were huge 7 plus foot square hide bears weighing over 300 lbs, 16 of them had skulls over 19 inches. We also killed 4 giants with skulls over 20 inches, and 3 of those bears weighed over 400 lbs! One weighed 440 lbs and the biggest skull was 21 3/16 on a huge 7 1/2 footer. It's unbelievable that we are doing this in the same area that we have outfitted in for 25 years, most bear areas go downhill in quality over time, ours has only gotten better!! The success of our bear hunts is due to trophy hunters who believe in proper management of our valuable bear resource and faithfully following our system. We also added even more volume and variety of bait which was a big help in getting and keeping more bears at the baits. Some hunters saw as many as 50 different bears in a 6 day hunt. We are still learning ways to make the hunting better and better. We ran the hunts this year from May 1st to June 15th and we killed several big bears in every week. The 4th year Randy Ginest crew mostly from Kansas came the 1st week and everyone saw or shot a 300 plus lb bear. Doug Kizzar got the biggest one at 19 4/16 skull, 325 lbs and it just happened to be a beautiful colored bear. Randy has booked the first week of the season for 2018, 2019, 2020... Repeat hunter Chris Peccia from Montana brought another great group of hunters and they too all saw or shot at big boars. 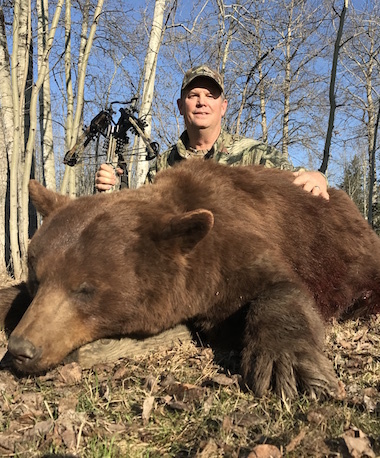 Bill Lloyd took the #1 and #2 bears that week with a 19 9/16 bear and an 18 14/16 one, both topping 300 lbs, his son Brent also got his first bear. Repeat hunter Keri Franklin with her husband Rick tagging along came on the 3rd week. Keri narrowly missed the weekly #1 bear spot with a huge 19 11/16 skull bear and Lee Lebrun took 1st place with a 19 12/16 giant that weighed 350 lbs. Jim Kilts, Pete Drummond and Bob Prince all took big male bears too. Jim, Pete and Lee rebooked a group of six hunters for 2019. The 4th week of the season was a group of six solo hunters who ended up all getting along very well. 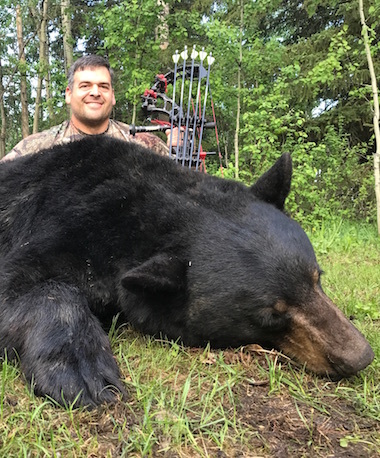 They shot six 18+ inch bears with 3 going over 19 inches, at 19 4/16 for Jason Suratt and 19 6/16 for Scott Murdoch, his bear also hit the 400 lb mark. 2nd time hunter Joe Skedel got the biggest one at 19 10/16. We shot the highest number of bears the 5th week, May 29-June 3, with 11 bears for 6 hunters. Six of the bears had skulls over 18 inches, 4 of the 6 went over 19 and 2 broke 20 inches. One by repeat hunter Mark Holbrook at 20 1/16 and the other by Marion Owens. It was the giant of the week at a monstrous 440 lbs and a 20 2/16 skull! The Kissella family, John, Jacob and Nathan came the 5th week and they continued to see lots of bears. Dad, John got the biggest skull bear of the year at Church bait with a Boone and Crockett qualifying 21 3/16 bear, it weighed 420 lbs! We donated a hunt to SCI Calgary and Ryan Quaschnick and Ryan Hickle bought that hunt and came up for the last 5 days of the season. Hickle killed a giant on the first evening at Doug's bait, 20 5/16, 375 lbs. We have the three hardest working guides in the business, Josh Harb, Cody Colbourne and Gerard Van Den Boogard and they got to do some bear hunting too. They all took big 19 inch skull boars. I even took a big one too after 9 years of no bear killing. Ana Terhorst was back again as our incredible cook. We are booked full for 2018 and may only have a couple spots left for 2019, we even have some 2020 bookings so don't delay in calling if you want to go on one of the best bear hunts in Alberta with Mike's Outfitting! Our bear hunts will only get better!! We also have some fall 2017 hunts still open. We still have some hunts open for this fall. We have had cancellations on our very successful Elk Rifle Rut Hunts. We now have three spots open for three hunters opening week of the season, Sept 16-23. We also have two Whitetail Deer Rut Hunts open for big Canadian Whitetails either Nov 7-15 or Nov 15-23. These are the arrival and departure dates flying into and out of Grande Prairie, Alberta. You can also drive right to our lodge, especially if you want to take the meat home from the elk, it's delicious! Feel free to call or email me about the hunts and visit our website for prices and lots of other detailed information. Thanks! Give me a call at 780-864-3770 or send me an email to book a hunt with Mike's Outfitting in Alberta, Canada.